Stimulant drug abuse is widespread at Marquette. Sunday evening draws to a close as Tim* cracks open his planner, eager to schedule out his week. After inspecting his syllabi and organizing his workload, Tim sees his calendar is full. His planning doesn’t end there; he needs to prepare his inventory. He makes a mental note of which days he’ll need to take Adderall, coordinating the ideal doses with what he needs to get done. Closing his planner, he lets out a sigh; now he’s ready for the week. This routine has become all too commonplace on college campuses across the country. Dr. Stephanie Kohler-Neuwirth, a psychiatrist at the Marquette Counseling Center, said in an email non-prescribed stimulant medication is the second-most commonly abused illegal drug on college campuses after marijuana. Non-prescribed use of these medications is associated with serious health risks and dependency. As a DEA Schedule II substance, they have a high potential for abuse, can lead to severe psychological or physical dependence and are considered dangerous. A 2008 study found 81 percent of students think non-medical use is “stigma-free” and “not dangerous at all,” even though drugs like Adderall and Vyvanse sit right next to cocaine and crystal meth on these schedules. Students also often fail to realize the illegality of non-medical use: Every time students purchase these medications, they are committing a felony. However, a university’s ability to regulate prescription stimulant abuse is extremely challenging. Such initiatives are often less visible in comparison to efforts to control the abuse of substances like alcohol. So why do students take these drugs, and why are the perceived benefits so great that they foster a student mentality that fails to recognize their dangers? What are the risks and side effects of taking these medications, and what, if anything, can universities do about it? As Tim starts his week, he knows his coordinated use of Adderall will help empower him to complete his tasks. For Tim, a heavy user who takes these medications two to three times a week for academic reasons and often several times on the weekend recreationally, the medication allows him to work longer and more attentively. Speaking on the condition of anonymity, Tim said Adderall makes his work more enjoyable because it gives him the energy to focus. Tim said the pill offers him a sense of security, because he knows he will be able to get his work done if he’s using it. As Tim uses the drug, he said his perception of time becomes skewed. He barely notices when he’s been studying for hours on end, which Tim describes as a “nice bonus” of the drug. And just like that, it’s the weekend. Tim can forget about his workload as he enjoys time spent not studying. Until Sunday night, when the whole process is repeated. The illegal purchase and use of prescription stimulants by non-prescribed users is supplied largely by their peers. According to a 2012 study published in the Journal of American College Health, 74 percent of all college nonmedical users get the drug from a friend with a prescription. Students who have a prescription can build what Tim refers to as “excess inventory”—sometimes, prescribed students do not end up taking all of their medicine every week or month (purposefully or coincidentally), and can easily profit by selling the remainder. “I know the guy I get it from buys all of his Adderall and Vyvanse from someone who has a large prescription and didn’t take any of it all summer. He has a ton of pills lying around, and sells them in bulk to my guy, who I buy from–all right on campus,” Tim said. Andrew, a junior in the College of Engineering who uses these medications about once a week, describes them as a fuel that drives his ability to succeed in a particularly demanding major. For Andrew, the intensity of his studies frequently leaves him with too much to do across a complex array of subjects. With the pop of a pill, this whirlwind becomes a concrete and organized schedule that he dives into vigorously. To him, the use of these medications is normal for people in his generation. As students start to relate their academic success to their future, they worry about their performance on exams and papers as well as their GPA. This is where Adderall comes in. Students often feel they can take the pill to ensure academic success and therefore a profitable future. 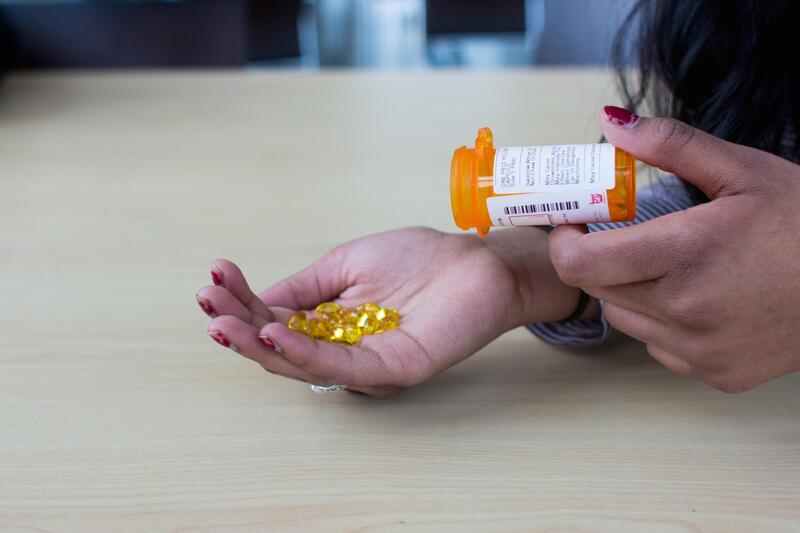 Taylor, a junior in the College of Business Administration who takes the medication one to three times a month, agrees that the college workload can be overwhelming. But he also points out that taking Adderall enhances his mood, which he believes leads to more productive study sessions. With increased confidence and a better mood, Taylor is able to enjoy his work more. He is motivated to complete it, and he avoids frustration. Even Patrick, a junior in the College of Arts & Sciences who does not use these medications, recognizes the benefits. Although he has never felt he needed them or that they are worth the money – depending on the dosage, the students said these medications have a street value of $5 to $10 per pill – Patrick admits he thinks they increase productivity. Ultimately, Patrick sees the use of these drugs as a matter of personal need in an academic environment where the ends justify the means. “You’ve got to do what you’ve got to do to get your stuff done, whatever that may be,” Patrick said. Regardless of how often people use the drug, many users believe taking the medication is a need confined only to the college years and not beyond. Tim, Taylor, Andrew and Patrick all emphasized the different type of work that comes with the “real world” as compared to college. The consistency of reading and test taking is replaced with a need to complete job-specific tasks, meet with people and work on different projects collaboratively – responsibilities they all agreed don’t require Adderall. According to a 2011 study from the Journal of Physician Assistant Education, more than 90 percent of students report using the stimulant for academic reasons, such as increased focus. However, some students see a recreational benefit in these medications and use them to party as well. Tim said it keeps him going on the weekends, allowing him to drink more for a longer period of time while making him more social. Taylor agreed, saying Adderall pumps him up, gives him energy and increases his confidence. The recreational benefits are particularly appealing to some users because they view them as milder, more financially-attainable and safer substitutions for harder drugs, like cocaine. Whether Tim is popping an Adderall and hitting the books, or Andrew is snorting a Ritalin and partying heavily, these stimulants really do seem to be a kind of “superman” pill for students. But with all these benefits, what costs are lurking behind the guise of these seemingly safe drugs? Austin said he uses the pill out of necessity. Without it, he would be more likely to make impulsive decisions and his ability to focus on any one thing would be seriously inhibited. Often non-prescribed users overlook the demonstrated clinical need some have for these medications in order to function at what Austin calls a “normal level,” but consistent use can take its toll in more ways than one. Although his body has become accustomed to the drug, Austin said switching to new medications, or being off medication, can lead to a harsh comedown or serious depressive effects, sometimes even fatal. Austin said he took Vyvanse – a drug many non-prescribed users seek because of its intensity – when he experienced the side effects. Non-prescribed users are susceptible to these same side effects, potentially to an even larger extent. Stimulant medications are associated with very serious health risks, even at low doses. Anyone, not just frequent users, can experience these negative health consequences. Kohler-Neuwirth said common risks include insomnia and poor nutrition, which lead to significant stress on the body and mind. Other serious risks with stimulant medications include seizures, cardiac conditions, changes in mood, delusions, hallucinations and even sudden death. For student athletes, stimulant medications can lead to a dangerous rise in body temperature. Tim, Taylor and Andrew attest to these side effects in varying degrees. All of them have felt worn out physically and mentally, claiming use often messes with their heads, leading to anxiety attacks, intense overthinking, a dramatic sense of urgency and even paranoia. One of the greatest risks is dependence. The drugs can be very addictive, not only in terms of the results they produce but also in a student’s propensity to use them routinely. Dependent users will eventually build a tolerance to the drug, which makes it necessary to take more of it to experience the same results. Kohler-Neuwirth said users might also find it difficult to stop when experiencing negative side effects. If they do stop, dependent users will likely experience symptoms of withdrawal, making it easy to slip back into regular use. Some users exhibit several of these symptoms without even recognizing them, she said. This risk of dependence is so intense that some users, like Taylor, cite it as the direct reason why they choose to use the medication infrequently. The addictive nature of the stimulants makes the likelihood of using after graduation relatively high. With the increasing availability of stimulant medications, the potential for misuse in older age groups has increased, particularly in young professionals entering the workplace. After all, there are many professional and personal demands after college. However, for many users like Tim, these risks are simply not enough to discourage abuse. Universities commonly prioritize initiatives related to alcohol misuse or other more visibly abused substances well before prescription stimulants. Such is the case at Marquette; although the administration acknowledges the presence of this abuse, it still remains a significant problem on campus. Chris Jenkins, a spokesman for Marquette, said in an email that the university has taken steps to identify signs of misuse of prescription stimulants by students. These initiatives include prohibiting the university’s medical clinic from providing prescriptions or fulfilling existing prescriptions to students, and offering comprehensive assessments from the counseling center to identify signs of concentration issues as well as stimulant abuse. “We encourage all of our students who are struggling with these issues to come forward and get the help they need, and provide encouragement to a friend or classmate who needs help,” Jenkins said. Tim compares any potential university efforts to curtail stimulant abuse to those of underage drinking on campus. No matter what efforts could be made, it will ultimately have no effect because students don’t think this drug use is a big deal. Students continue to abuse these stimulants and see results. Even recognition of the health risks doesn’t seem to deter their use. They believe the benefits outweigh the costs. But for many, the negative effects eventually manifest themselves. It’s only a matter of time before the superman pill becomes their kryptonite. *Name has been changed to protect the identity of a source.